Get to know the different types of privacy mesh and appealing alternatives. 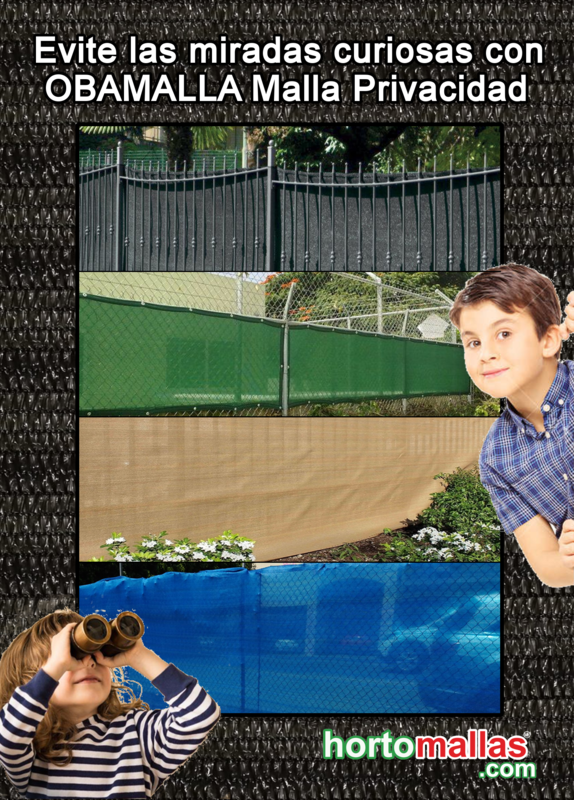 Here you will find several solutions at your fingertips for the privacy of gardens and construction sites. There are different products and meshes that can help you avoiding the curious looks in order to obtain the intimacy you need either at home or your workplace, which we will describe next to help you choose the one that fits your needs best. When it comes to garden privacy the most practical option is installing a privacy mesh over an existing structure or wooden poles, enclosures or grids. This mesh is made of plastic which is 100% ecological, odorless, and non-toxic for persons, kids or pets. We offer OBAMALLA in different presentations, with 88% offered in attractive colors such as: green, white, beige, and black. We also have the original tricolor (green, white and red), and the elegant bicolor (white and blue). As well as thicker ones for more privacy, such as the 95% in green, beige, blue and black; where the most popular are ones are the black, which absorbs the light and provides more privacy and the green, which visually lets the eyes rest. With an exclusive, trendy, and elegant design this is an option that doesn’t prevent luminosity and air flow, but still ensures optimal coverage. It offers people, plants, and animals a good rest from both noise and looks. Also, this mesh is used a lot for construction sites because it can be used in temporary installations thanks to its low-cost. It is available in convenient rolls that can be transported easily and immediately put to use. OBAMALLA can be attached to a wire mesh or an existing structure through eyelets or with staples, make sure to secure it with wire cables in order to keep it well fastened because with the friction with the wind its durability increases. Privacy coverage with OBAMALLA apart from avoiding neighbor’s intrusion, prevents hedges from growing. Keep your work area cleaner and more organized according to safety standards. Once installed over poles the fence works as a barrier that protects from dust, pollution and drains. The mesh also offers protection against atmospheric agents like the wind. If the mesh limits the property of a highway it is possible that water from puddles where cars drive through reach your garden. OBAMALLA keeps your property protected from water splashes. Thanks to the quality of the plastic used in this mesh and the treatment against UV rays degradation the privacy mesh is resistant to atmospheric agents. 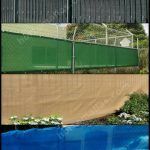 In comparison with the cost of a traditional fence this privacy mesh is not afraid of comparisons. The cuts we have available cover heights of up to 210 cm tall and even more. This mesh brings you the privacy you need and at the same time it allows air to flow freely. The woven mesh can be easily attached and secured to its support base; and this is even easier if it’s made of hem and metal eyelets for a solid and safer installation. Hides weeds from the neighbor! 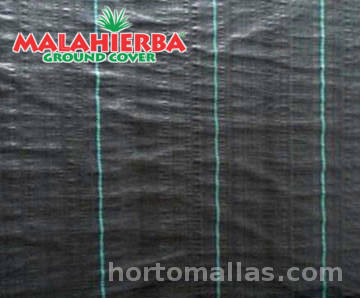 Another option that we offer in order to ensure maximum privacy in gardens, patios, and terraces is MALAHIERBA groundcover mesh. Durable fabric made in high density polypropylene, it blocks up to 100%. It is available only in black and it has a very low cost; but if you need something that lasts longer, then other solutions are recommended. 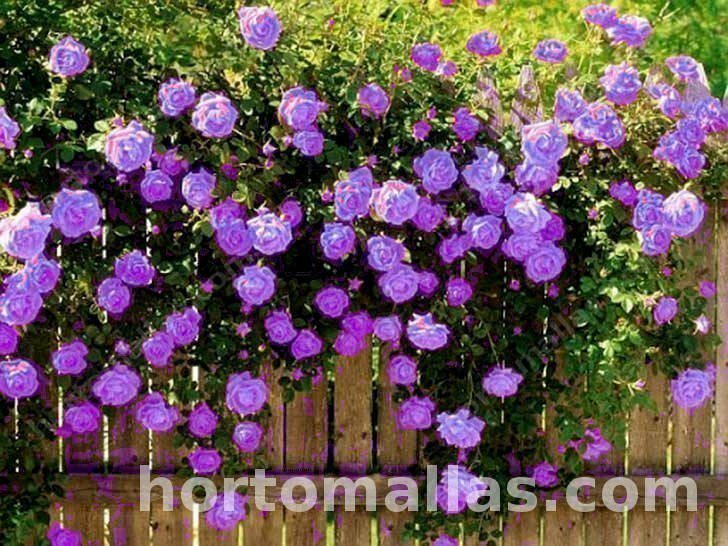 MALAHIERBA keeps unwanted eyes from looking over your patio or garden area. 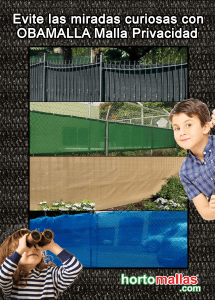 This fabric is easy to install: it only needs to be secured over the fence using a steel cable or attached over poles or rails. It is an ideal solution for areas where certain area is being limited, to avoid the passage of dust and debris, and to offer a better appearance. it is recommended to install it in favor of the wind so that airbags don’t appear. It can be installed in a very simple way it just needs to be adjusted with staples approximately every 30 cm. This way the cover stays completely closed in both upper and lower parts. It turns out to be very practical because it stays hooked with a small tightening and can be put together with several pieces of stapled shade cloth. A wire combined with the metallic fence can be added in the middle in order to strengthen the privacy netting and to avoid the appearance airbags for better fastening and security. protect your privacy and add a decorative touch, revive your garden instantly. We have a new product line for maximum coverage and aesthetic effect, which are the ideal complements for walls and garden fences. In case of requiring privacy and decoration but also wanting to keep a natural aspect we suggest ERBETTA, artificial foliage that can be vertically installed over cyclonic mesh and panels. 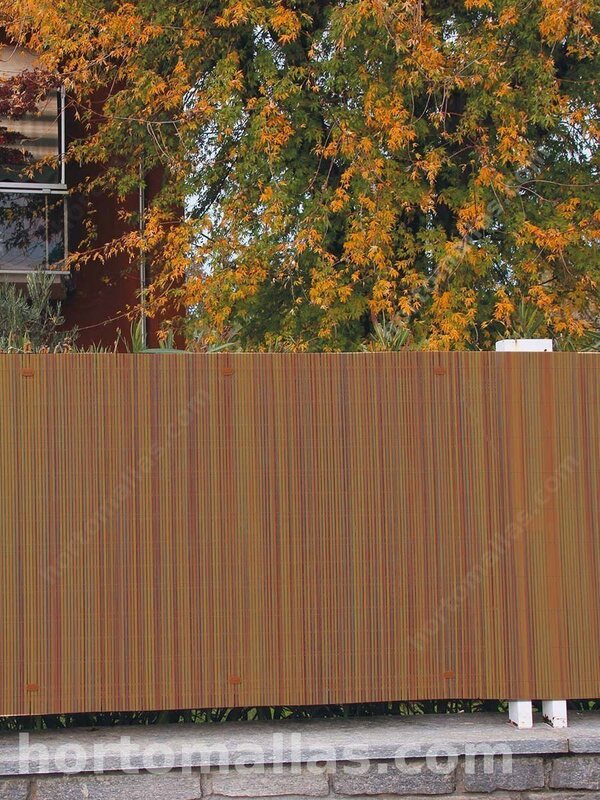 Panels are made of artificial decorative plants, which are available in a wide variety of colors and shapes. 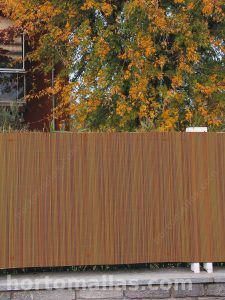 They are ideal for both outside and inside decorations, landscape design, wall coating, garden fences and privacy protecting fences. Perfect for events as well as for permanent architectonic elements, for house decorations, ceremonies, exhibitions, displays in hotels, offices, and shopping centers, etc. Made of high density plastic material resistant to the degradation caused by UV rays; it can be used outside for up to 10 years without fading or losing leaves, this with the correct type of care. Easy to install, can be assembled in any wall or fence. Green fixation elements are included; the modules can be cut to adapt to any form or place. • Nice and durable, do not require water or maintenance. • Easy to install, can be fixated like a coating. this cheap solution can be adapted to a wire fence. 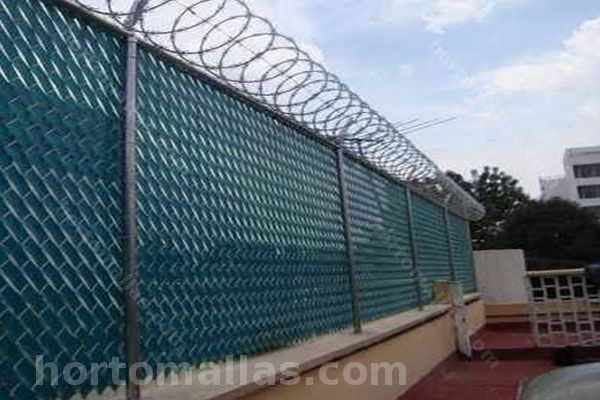 Plastic privacy netting made for cyclonic mesh. The blinds for cyclonic mesh are made of plastic strips or tapes that are manually woven between the meshes of the cyclonic mesh. The advantage of this solution is being able to have a privacy mesh in a trellis while using the minimum resources; the disadvantage is that it requires a lot of manual labor and time in order to cover large areas. This means that the strips need to be woven in the holes of the cyclonic mesh one by one. The result is a good aesthetic impact taking advantage of an existing structure, even though it is not very resistant to the wind. It is made with high quality polymer and additives, which work against UV rays in order to ensure a long life. 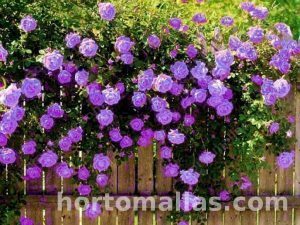 make your plants grow easily in order to create green curtains with climber plants such as: bougainvillea, ivy, bellflower, lady of the night, covering fichus, etc. Preferably with a wide leaf, in order to reach a bigger covering with or without flowers. Cover options are 100% natural. These plant varieties grow by leaning on a trellis mesh and can create beautiful terraces, patios, balconies and garden; they grow vigorously thanks to the support of HORTOMALLA but like any type of vegetable their type of care depends on climate, temperature, light grade and type of soil. ts biggest disadvantage aside for how much time they take to grow, it’s the maintenance (for example pruning to control their growth), its changing aesthetic throughout the seasons, and that they attract different types of animals and insects. Fast to install, isolate your house from curious looks and embellish the facade with this elegant alternative that can be easily installed because you don’t need additional structures. Once you buy it, it can be set up without using any tools, the only thing you need to do is follow the installation instructions. Avoid neighbors from “taking a look” at your property and at the same time delimit it. Synthetic bamboo grids don’t need maintenance and have a very fine finish. They represent an excellent solution to limit an edge and guarantee all the privacy you need. Bamboo grids are widely used in gardens, terraces and balconies. Natural ones do not resist humidity and produce mold which cause it to easily rot. Vertically installed they protect your privacy from the look of others or from the wind, like shields. When installed horizontally they protect exterior spaces. It is also an optimal solution to protect cars from solar rays. Bamboo grids offer a refined and sophisticated touch. Our products have high design content which makes them the perfect complement to decorate with style and good taste. They are made with materials that cover very specific uses, or with technical characteristics that are very specific. You can find this wide variety of products in Hortomallas. Also, to give you the opportunity to equip your garden in the most economical and effective way we offer these grids in cuts per meter. Thanks to its high quality manufacture they have an exceptional resistance to breakage and elements. We also provide clips to attach fabrics and privacy mesh easily as complements for the installation. Thanks to tightening threads or steel cables a better stability of the meshes is ensured, along with longer durability.